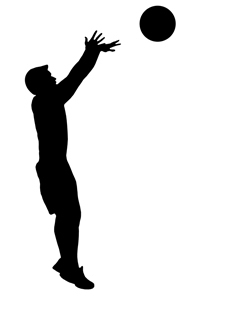 In this installment, we will finish the jump shot skill set by discussing the other four keys, “dip,” “extend,” “flip,” and “crash.” As we discussed last time, it is likely ultimately more functional to further simplify this skill set into even fewer keys, however, for teaching purposes, the seven step approach will allow us to be highly specific without unnecessarily confusing the young athletes. Over the years, I have grown fond of referring to these issues as the ‘Likely Bunch’ and have created a training template intended to meet of the aforementioned needs as a matter of principle rather than what an assessment tells me. In working with young athletes, there is very little reason to ever ‘test’ their ability at certain lifts or speed variances. Your programming guidelines must be based around instilling proper execution of technique in your young athletes from a lift and movement economy standpoint. Having said that, gleaning 1, 3, 5 or 8 RM values on any particular exercise should be deemed a distant secondary consideration to teaching the proper values of form and function. By using a ‘Teaching Model’ of exercise development rather than a ‘Training Model’ you are taking the pressure off of kids to reach for biomotor improvements at the expense of developing sound technique. Although when training adult clientele, there are neural advantages to altering your exercise selection often, with young athletes the reality is that the initial stages of training should comprise little more than dedicated time to teach and become proficient in the basics of lift and movement economy. Far too often, trainers work to make young athlete routines challenging and neurally stimulating by incorporating complex programming and exercise selection into the mix early in the athletes’ training life. Resist the urge to make a neurological impact and instead, focus your efforts on developing sound competency in just a few basic lifts – the foundation you build during this time is paramount to eventually increasing both the volume and intricacy of your programming. 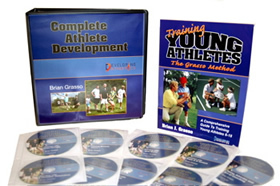 When creating a training program for a young athlete, you must take into consideration their entire life – that is, don’t just make training sessions hard for the sake of making them hard. You do a disservice to the athlete and your business by following this practice. For instance, if the young athlete is in-season for a particular sport, there practice and game schedule must be considered into the reality of your overall programming. Soccer practices, for instance four days per week coupled with one to two games per week, will leave any young athlete bordering on the verge of overtraining syndrome as it is. Your job during times like this is to augment them with restorative training that does not serve to push them lower beneath what would be considered normal and healthy biological levels. Additionally, you must work to understand your young athletes’ eating and sleeping habits as well. Inappropriate nutrition and poor sleeping patterns (which many teenagers face today) are precursors to overtraining syndrome in that they are two of the more important restorative elements trainees can use to combat such concerns. As a professional trainer working with young athletes, you are responsible and must assume accountability for their overall health and wellbeing. When training young athletes and in an effort to ensure quality, efficacy-based training practices, resist the temptation to do the ‘norm’ by making exercise sessions hard and physically challenging. Instead, follow the three key points above to ensure optimal training conditions and guard against the very real concerns of overtraining.